That zigzag path on the left is actually a road. “Eagle Bends” must be Norway’s most dramatic road. The lower part runs in a spiral tunnel, then climbs in 27 hairpin bends to about 1,000 metres. Here at the edge of the road is “Eagle’s Nest”, with a fantastic view of the valley. 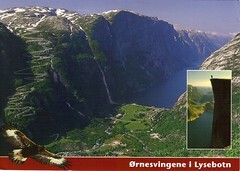 Received via Postcrossing from Joey and the Cats, in Norway. Thanks, Joey & the Cats! Previous Previous post: St. Ann’s Church, Vilnius, Lithuania.